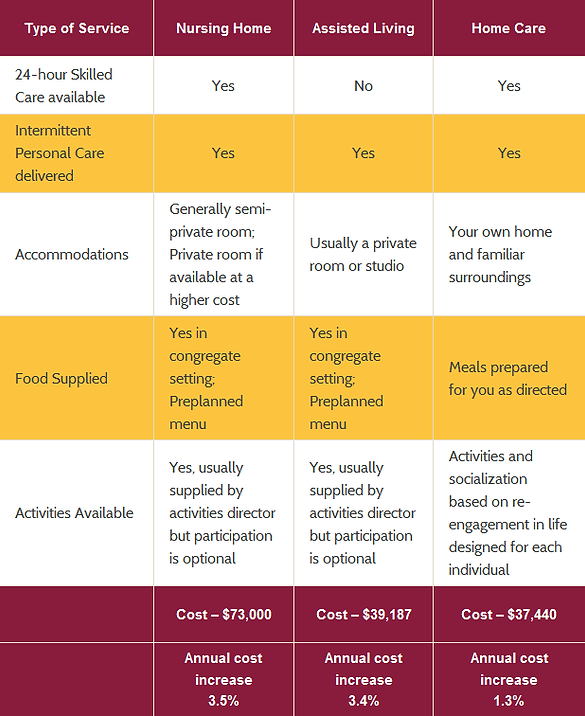 We’ve created the chart below to highlight the different levels of care including nursing home care, assisted living and home care with the approximate cost of each type of care and to highlight how home care can an affordable alternative to institutional care, and an option preferred by most families. If you have any specific payment questions, we encourage you to contact us. Home Care is NOT covered by Medicare. This is important to realize because these services are generally covered by private pay. Medicare pays for Home Healthcare which is a temporary service that provides skilled services like nursing oversight and therapies. Home Care is traditionally activities of daily living oriented and is not covered by Medicare. Long term care insurance will pay for Home Care, so if there is a long term care insurance plan, let's discuss how to apply this and meet the requirements. Skilled services for those under 65 can be covered by insurance, and we encourage you to call and determine our ability to supply services through your insurance. If you have any specific payment questions, we encourage you to contact us any time!